A referendum to elect Bolingbrook’s trustees by district hasn’t been certified yet, but opponents have unveiled their campaign. 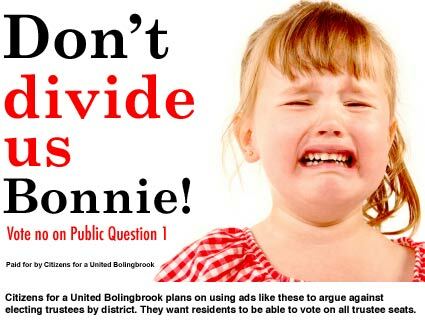 Titled “Don’t Divide us Bonnie,” Citizens for a United Bolingbrook hopes to turn the referendum into a vote against Citizens for a Better Bolingbrook. CFAUB plans to run several ads on cable TV. The first ad shows alleged Bolingbrook residents standing by Barber’s Corner. Man1: There is an earthquake coming. Woman1: They say it could tear us apart. Man2: It could force families apart! Woman2: It could raise our taxes. Woman3: It could force me to get an abortion and enter into a gay marriage. Man3: But if we vote against Bolingbrook Public Question 1, we will survive the earthquake. Husband: Thanks to Bonnie’s districting plan, our house will sit on the boundary between two districts. Wife: Our house and marriage are divided. Boyfriend: Thanks to Bonnie, I can’t see my girlfriend because she lives in a different district. My parents think I should only date people in our district. Girlfriend: Bonnie has ruined my life! Narrator: Vote No on Bolingbrook Public Question 1 and keep our families and our homes united. All: Don’t divide us Bonnie! The third ad makes a questionable comparison between Chicago and Bolingbrook. Narrator: Since Chicago was divided into wards, crime, corruption, and panhandlers have skyrocketed. Chicago’s aldermen only care about serving their own wards, and not the good of Chicago. Now Bonnie wants to divide Bolingbrook into districts. A district is just another name for a ward, and look at how well they’ve worked for Chicago. This February, vote no on Bolingbrook Public Question 1 and let’s send a clear message. Don’t divide us Bonnie! The final ad might get the coalition in trouble with the Valley View School District. Fake Bolingbrook Girls Basketball Team: Don’t divide us Bonnie! A source who has a cousin who is close to Citizens for a Better Bolingbrook’s legal team, says their public question will not divide Bolingbrook. The source also insisted that CFBB submitted a notice to The Babbler that they intended to circulate a petition before the 108 day deadline. Publisher Chris Olson said that it didn’t matter if The Babbler didn’t print the notice because it hasn’t been a paper of record since his father told the first female mayor of Bolingbrook that women had no business being mayor. “We’ve come a long way since then.” Said Olson. Lisle protester: Navistar will lay us off, kill us all, then go bankrupt! George Hrab: I will play at Clow UFO base next year!